This Is a 3/4 March composed by a South African Composer. Liam O'flaherty, wrote the tune as a tribute to a man that had given him a set of Silver and Ivory Bagpipes.However there was a heavy price put upon the pipes, not one of monetary value but rather a task. For Liam to keep the pipes he had to agree that if anyone asked him to at any time of day or night he must play the pipes. This tune is a lovely 3/4 march with an interesting call and answer structure. It is important to pay careful attention to two bar phrasing in this tune. It is often missed by less experienced players. To compete or not to compete. Last weekend I was helping some of my learner pipers tune up for a novice march competition. One of the the pipers told me that he did not want to compete. This got me thinking why is it important for a piper to compete. Some of the reasons you might choose not to compete are. 1. Avoid the stress of it all. many pipers might decide never to compete or to stop competing because they can not handle the stress of being compared to there peers. Few pipers are calm when they compete. 2. Some Pipers stop competing after a bad set of results. 3. Time is probably the only reason I have not competed this year. It requires a lot of time to prepare to compete. 1. Competition helps you set goals with deadlines that have to be met. 2. You get objective feedback on how you are playing, the feedback is not bias, such as that of your own or your tutors. 3. You learn to play under pressure and this improves your playing in gigs. 4. Getting to know other pipers. Competing helps you build comradeship with other pipers. 6. Pushes you to learn tunes with more attention to detail; timing, grace notes and clarity. 8. It is the only way to earn the respect of your fellow pipers. So it has been some time since i posted. However some changes in my life should see me posting more often now. One of the activities that i am involved with in the piping world is getting a new Pipe Band off the ground at Cornwall Hill College in Pretoria. 1. Maintenance must be of thee highest standard, we cant all play like world champions however we can maintain our instruments like world champions, I conduct regular maintenance inspections of all the instruments in the Corps. 2. Weather it is a practice or a function or a competition the routine remains the same. 4. While every one is playing I tune my own instrument, I then use an electric tuner to take a reading off my drones. 5. Now I put my own instrument down and quickly go to each of my student pipers and set there drones to the tuner. 6. Once all the drones have been tuned I call the corps together and we play through a set. Usually around 4 parts of march. 7. I now walk off about 15m from the pipe corps and take one piper with me. The rest of the corps continues to play through the music they know. 8. Once i have tuned up the piper that came with me I send him/her back and they send me the next piper. 9. After checking and tuning all the chanters in the band I return to the band and we play a set together. 10. Then I cut the band and tune my own drones once again. I then take a reading once again with an electronic tuner. 11. I count the band in to a set, then I move around the outside and tune the drones again. 12. I now call the drummers over to join our practice. Tuning the Great Highland Bagpipe can be a great challenge if one is not familiar with the correct methods. a. Is the bag leaking? b. Are the Stocks cracked? c. Are the joints with hemp sealing? d. Is the blow valve sealing? e. Does your blow stick or water trap restrict air flow? f. Leaking reeds and reed seats? a. Is your posture correct? b. Is your bag the right size? c. Is the blow-stick the right length? d. Are your drones held vertical on the shoulder? Bret describes a relaxation exercise for pipers that you may find useful, in this post I would like to discribe a similar exercise of my own. Lying flat on your back, think about each part of your body in turn. Tense It up as tight as you can then relax it. Start with the toes. Tens up the mussels in your toes for around 2 seconds then release and allow them to relax. well if we compare prices of the DB-90 and the DB-60 the latter comes in at roughly half the price. So at half the price what have they left out? well the DB-60 wont count in a human voice, doesn't have a foot switch control, wont accept input from v-pad drum pads, or rhythm coach your drumming via a built in microphone. barring these feature the DB-60 can do every thing the DB-90 can do. So for half the price you get a neat portable device with all the feature useful to a Piper. single beats, accented bars, triplets, syncopation. 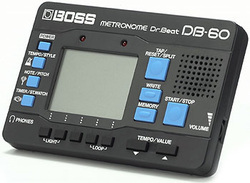 the DB-60 can match any time signature. out the time and change to beat each note of the "FED" run every time it comes around in the tune. 8-beat, 16-beat, Shuffle, Funk, Dance, Country, Reggae, Clave, Rumba, Bossa nova, Waltz, Tango, Mamba, March. Spend time programming you loop play back and save it for use any time in the future. A very sturdy device. It even handle a fall onto a tiled floor with no visible marks afterwards. Even with extensive tugging and ruff handling the rubber buttons stayed firmly seated. Overall and excellent build quality. The DB-60 is priced to please, yet it doesn’t disappoint in the feature department. This handy little timekeeper can lay down the click in style. As a result of going deaf from years of playing the Bagpipes the only thing I would Change on the DB-60 would be to make it a little Louder.